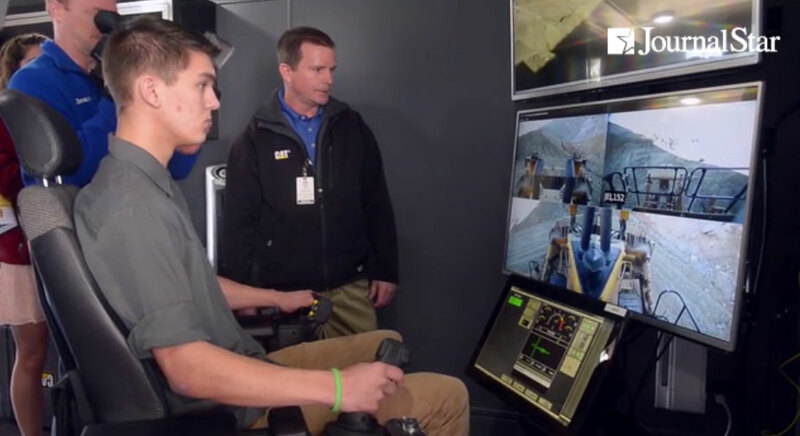 EAST PEORIA — A distance of 1,500 miles was no impediment for East Peoria Community High School students operating a Caterpillar Inc. bulldozer. The teens took turns Thursday experimenting with moving a D11T around a proving ground in Tucson, Ariz., as remote operators from a trailer outside of the company’s Building CV in East Peoria as part of a demonstration of the emerging technology dubbed Command for Dozing. Ultimately, the company is “working toward the autonomous mine site of the future,” Watkins said. And those changes appeal to students like EPCHS freshman Jared Biggs. It absolutely is, if also a bit more futuristic and interactive. The command console, designed to be operated just like the controls in the cab of a bulldozer — except with some added touchscreen controls in place of switches — features live-feed cameras from the front, rear and sides of the cab. Those views are supplemented by another, longer-distance view of the work area. Such remotely operated setups allow users to drive the earth-moving equipment from a distance anywhere from a few feet away to a point thousands of miles distant. Discover the rich catalog of cranes and manufacturers we work with.